Most surfers like to surf during the fall season. It’s a perfect combination of time and environmental conditions. The beaches are less crowded and a lot of offshore winds are making a nice mix of swells. Here in California, the crisp fall mornings offer a variety of surfing pleasures: from endless morning offshores to swells from every angle. That’s why you’ll find a lot of us surfers in the beach around these times. The water is fine too; September is the warmest month and usually remains so even in October when the ocean temperature is still at 70ish F. The warm water is perfect for swimming and with the school break now over, you’re left enjoying the ocean in the company of your fellow surfers and divers. Except that you’re not really alone in the water. For some time now, the warming of the ocean has brought about a few changes in the marine ecosystem that is making surfers become more wary than usual. Sure, there’s the occasional case of a shark sneaking a bite off an unfortunate surfer but that’s par for the course when one looks like a seal paddling on the ocean surface. What I am talking about is the increasing number of jellyfish that’s been spotted in our waters. Scientists are noticing that jellyfishes are coming earlier and staying around longer due to the rising ocean temperatures. This increases the chances of them coming into contact with swimmers. Now ordinarily, that is not a cause for alarm. Jellyfish found in Southern California are usually smaller in scale, generally harmless, and have a more mild sting than other species in its family. Bear in mind though that when I say relatively harmless, I mean they’re not deadly but their stings can still be dangerous. The most familiar of them is the moon jellyfish, a nearly colorless creature with four horseshoe-shaped markings on the center and many tiny, short tentacles. Another relatively harmless jellyfish is the cannonball jelly which is exported to Asia because, apparently, it’s a culinary delicacy. The colorful purple jellyfish, meanwhile, has flashy dark purple stripes along its bell body and surrounded by 20-foot-long tentacles. But there are occasions when a deadly species of jellyfish happens to find its way into our part of the ocean. When that happens, it’s a disaster that’s waiting to happen. And judging by the reports, it’s occurring more frequently. In 2010, scientists at the University of British Columbia found out that global warming was causing 2,000 different jellyfish species to appear earlier each year and expanding their number. In Australia, in particular, box jellyfishes are arriving sooner and staying longer in more southerly beaches. Most deadly jellyfish species live in warm, tropical waters. Organisms like the box jelly, the Carukia barnesi and the Malo kingi regularly cause the deaths of unsuspecting swimmers in the Philippines and Australia. The most venomous jellyfish of them all, the sea wasp, is a basketball-sized jellyfish that lives in the Indo-Pacific waters and can kill an adult human in three minutes. Now we all know how water currents are significant in the marine ecosystem. Not only do they redistribute water, heat, nutrients and oxygen about the ocean, but they also sweep over and carry off living organisms. 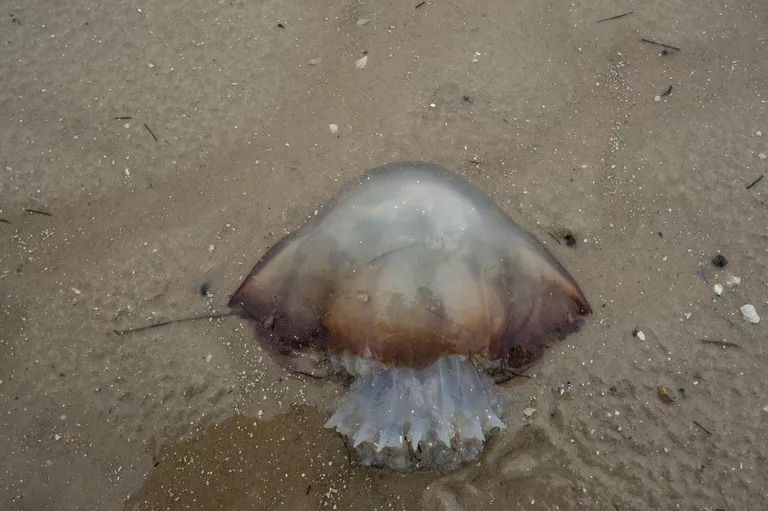 During the summer months when the current begins to bring warm water from the tropics to our shores, some of these nasty jellyfish species are taken for a ride. When they are dropped off in our portion of the ocean, they often find themselves in optimal conditions to breed, and so a jellyfish bloom suddenly occurs, to the detriment of everyone. 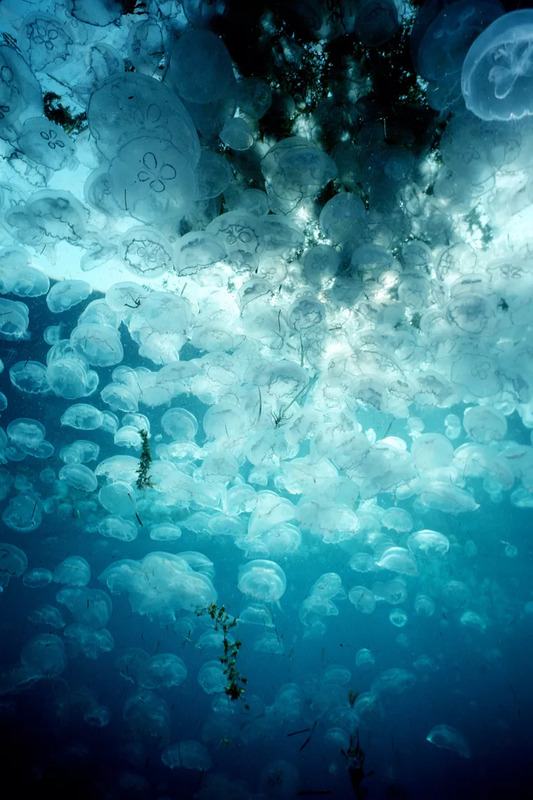 What is alarming now is that while scientists consider the jellyfish bloom phenomenon as a normal part of a jellyfish’s life cycle in its natural territories, the rising temperatures of the ocean caused by global warming are now creating new territories for these creatures. As greenhouse gases increase in the atmosphere and trap more energy from the sun, the oceans absorb more heat. These results to an increase in sea surface temperatures and rising sea levels. Normally cold waters are now warmer than usual. And that’s an optimal condition for jellyfishes to survive. Already, there’s data to support these observations. In 2010, scientists at the University of British Columbia found out that global warming was causing 2,000 different jellyfish species to appear earlier each year and expanding their number. In Australia, in particular, box jellyfishes are arriving sooner and staying longer in more southerly beaches. And if that wasn’t enough, there’s now evidence that suggests these jellyfish blooms are also contributing to global warming. When these blooms reach the end of their life cycle and die, their decaying bodies are full of carbon that the bacteria in the ocean cannot utilize. Instead, what these bacteria do is to dispose of the carbon through respiration, which essentially returns carbon dioxide to the atmosphere. It doesn’t help that its natural predators can’t keep their population in check. That’s because they are being killed due to over-fishing. That’s right. Worldwide, blue fin tuna populations are declining and sea turtles are too busy being killed off by plastic debris so there are less of them to eat the jellyfish. 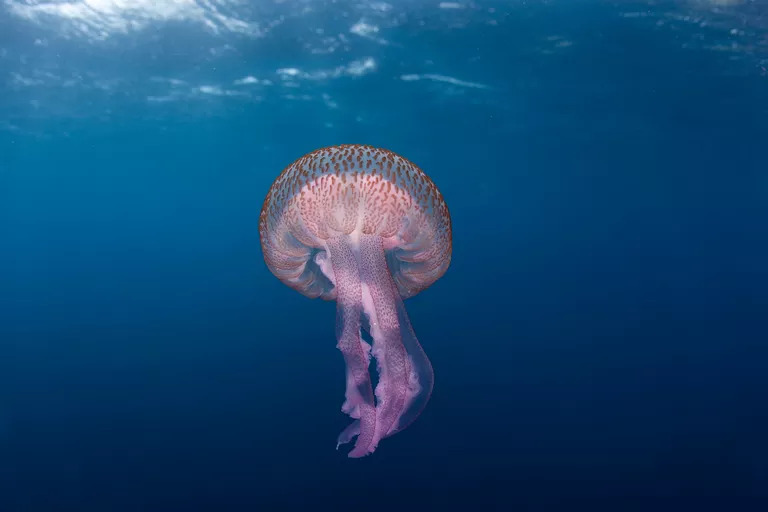 With all these jellyfish running amuck all over the ocean, there is now an increase in risk for us warm-blooded mammals when swimming or surfing. Worldwide, around 150 million swimmers suffer jellyfish stings every year. Mercifully, however, only 50 die from jellyfish stings each year. That’s a higher death toll than from a shark attack which only claims 8-10 deaths a year. So what’s a surfer got to do if he gets stung by a jellyfish? Assuming it’s not any of the deadly species – in which case, all bets are off- don’t wash it off with urine. Seriously, dudes, it doesn’t work. It’s more likely going to irritate the jellyfish venom cells, called nematocysts, into producing more venom, causing you more pain. What you should do is pour seawater on the affected parts to wash off any bits of tentacle left stuck on you. You can pick off the visible bits but don’t use your fingers since these bits are still capable of releasing venom. Use a pair of tweezers. Don’t use freshwater or vinegar either. In Australia, they’ve found that using vinegar will actually cause box jelly stingers to pump more venom into the victim by 50%. Don’t rub the afflicted parts even after washing them with seawater. You might still have “live” nematocysts waiting to inflict more venom. Same goes with touching even dead jellyfishes; they are still capable of delivering nasty nematocysts to your fragile skin. Go seek medical help. Like, stat! The worse you can get out of it is an extended stay at the emergency room being treated for rashes and pain. But if you happen to be stung while surfing in tropical waters, getting treated with the right antivenin will save your life. You’ll get to surf again for another day. The jellyfish situation is just an example how climate change can overthrow the delicate balance of the marine food chain. Take down one critical step and the rest falls down. It’s another grim warning for us as we continue on using fossil fuels. As of this May, we have gone further over the carbon threshold. We’ve already turned on the ticking ecological time bomb. The question is, what can we do in order to turn it back? Here at Wave Tribe, we seek to lessen our dependence on fossil fuel by developing natural hemp surfboard traveling bags, bio resin surf boards and natural eco-surf wax. And we are not the only ones; others are also on the same mission. In a way, we’re also setting up a reverse domino effect. As more of us find ways to offset the surfing industry’s carbon footprint, the more we hope that our efforts will encourage other industries to follow suit. Because only by joining forces can we hope to begin to roll back the clock towards restoring our oceans, with enough fishes and turtles to keep jellyfishes-at least, the killer ones-at bay.